Henry IV was born in 1366 the son of John of Gaunt, Duke of Lancaster, who was the fourth son of Edward III. During the reign of Richard II, Henry was made Earl of Derby and Duke of Hereford. 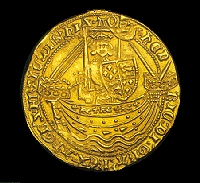 A personal dispute broke out between Henry and the Duke of Norfolk, who he accused of treason. The Duke of Norfolk challenged henry to single combat, but King Richard would not allow them to do battle. Both were banished from the kingdom, Norfolk for life, and Henry for a period of several of years. On the death of his father in 1399, Henry succeeded as the Duke of Lancaster. Henry returned to England from his exile to claim his inheritance before his alloted time. Once back in England, Henry was joined by the Earls of Northumberland and Westmoreland, which placed him in a position with an army of 60,000 men. Henry and Richard met in battle and Richard was defeated, taken prisoner, and eventually deposed as King. Henry was then hailed as King of England taking the name Henry IV. Nevertheless, all would not prove to be so easy. England was then thrust into civil war between the houses of York and Lancaster. 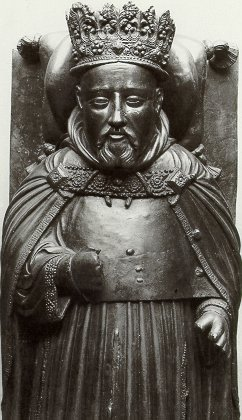 Henry IV faced many difficulties during his reign. The Welsh revolted under Owen Glendower; the Scots invaded England, and were defeated at the battle of Homildon Hill; the powerful house of Percy led an insurrection, which was crushed at the battle of Shrewsbury. Henry also was the target of numerous plots against his life, and parliament continued to assert their rights. All of these political troubles created great difficulties for the economy and the finances of his administration. Henry became a very unpopular king. The stress gradually wore down his health and his mental state. Henry finally died in the year 1413, and was succeeded by his son Henry V.